This is Laetiporus sulphureus, also known as Chicken of the Woods. 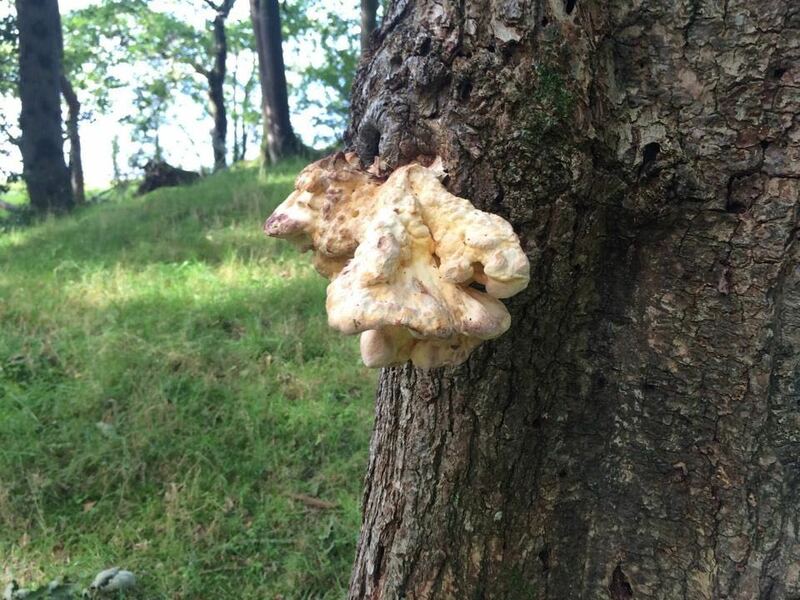 I found this fungus growing on an Ash tree (Fraxinus excelsior), Summer 2014 in the Lake District, by Bassenthwaite Lake. This fungus grows on a wide range of broad-leafed trees and conifers, from early Summer through to Autumn. Yes, thats right, despite its label as a ‘parasitic’ fungi, we can eat it. It tastes very nice, like chicken! There are many simple, rustic menus online. You shouldn’t eat this mushroom raw and pick only fresh, young brackets. The bracket is young when it is yellow-orange coloured. As it becomes pale, it begins to degrade into a white consistency. The fungus I found is pale. Needless to say, I didn’t eat it. This is a parasitic, fleshy fruit body, growing on the main stem, buttress and principal roots of its host tree. It attacks its host degrading the cellulose walls, creating a brown rot in the decayed wood. Once a significant portion of the tree has decayed, the fungus will cause the stem or branches to fail. However Chicken of the Woods is the main hollowing agent of our Ancient Oaks, Sweet Chestnuts and Yews, which have been known to survive with the fungus for centuries. Now is the time to discover the taste of Chicken of the Woods. If you find a bracket this Autumn, please send me a photo. If you are brave enough to eat it, I’d love to know you’re recipe.